ZUCA Skates & Bows Insert & Frame. 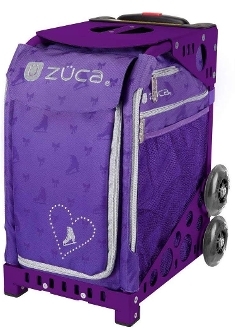 Stylistically enhanced with a cute pattern that incorporates skates and bows, the print on this ZUCA sport is adored by skating sweethearts who reign supreme as champs on the ice. Turn your Zuca into a weekender bag with Pro Packing Pouches. The Pro Packing Pouch Set includes five packing pouches of various sizes and a one quart TSA compliant toiletry bag and allows you to pack your clothes like a pro. The Pro Packing Pouch Set fits both the ZUCA Pro and the ZUCA Sport. Options to purchase seat cushions, pro packing pouches and stuff sacks.